On May 20, 1926 Mary Maude was born to Walter and Mary Dell. She was the first born of sixteen children. On Saturday, November 24, 2018 God called her home to be with him. She accepted Christ at an early age and was a member of St. Peter AME Church in Headland, Alabama. She attended school in Headland, Alabama. December 12, 1944 Mary married the loved of her life Ed Sanders in Donaldsonville, GA. The two joined Mt. Carmel Baptist Church in Ashford, Alabama. They later joined Nichols Chapel which is now Stringer Street AME Church. The two enjoyed sixty-six years of marriage until Mr. Ed’s passing in 2011. Mary also raised adopted other children: Betty Neely, Natasha Sanders, Catherine Smith, MC Patterson and Willie B. Patterson. Mary was a homemaker and enjoyed taking care of her family. She enjoyed cooking baking taking care of her plants, sewing and crocheting. 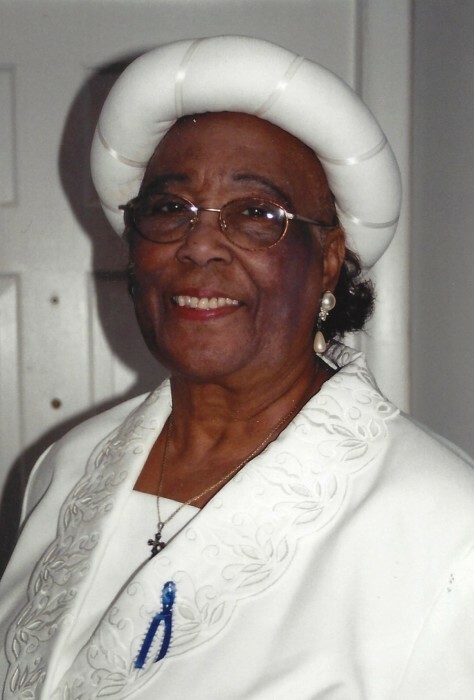 Mary was a faithful member of Stringer Street AME Church for many years and was proud to be a life member of the Missionary Society. She loved her church and was a faithful member. She served her church in many capacities of the years including member of senior choir, stewardess, Sunday school teacher, and chairperson of the courtesy and care committee. Mary was preceded in death by her parents; her husband: Ed Sanders; her son: Eddie Sanders; grandson: Eddie Ira Sanders; brothers: James Walter Thomas, Loyd Thomas and John D. Thomas; sisters: Caterline Marsh, Montest Underwood and Annie T. Maye; daughter-in-law: Ruth Sanders; and a best friend: Enogene Cummings.